Google Suggest is a useful default feature which can predict what users type in the search box and offer relevant suggestions in real time. For instance, if you type “home” in the search box, Google Suggest will immediately offer you a list of suggestions started with home, e.g. 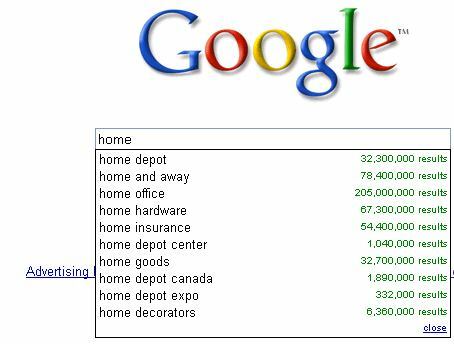 “homebase”, “home office”, “home for sale”, “home insurance”, “home goods” ,etc. You could just click on the relevant search word/phase if it appears in the list to get the search results. This default feature surely will enhance your internet experience. Or will it? Do you find the second guessing a nuisance instead? If you don’t feel Google Suggest is helpful but irritating, just switch it off. How to switch off or disable your Google Suggest feature? The process is pretty simple. Just go to the Google Preference Page, look for the “Query Suggestions” section which is located at the bottom of the page and check “Do not provide query suggestions in the search box”.